Streamlight TLR – 1 Light for Glock / 1913 Rails… intense lighting for your tactical needs! Put a floodlight right under your barrel! The Streamlight TLR-1 Tactical Gun Mount is an intensely bright, virtually indestructible tactical light that attaches / detaches to any gun with Glock or 1913 (Picatinny) rails in seconds. Plus all the other functions that make Streamlight the choice of real professionals. 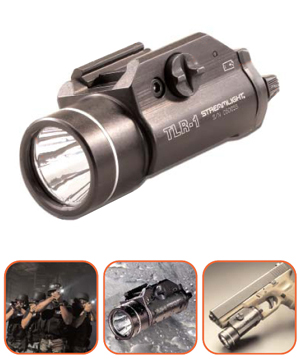 The Streamlight TLR-1 Tactical Light is backed by a manufacturer’s limited lifetime warranty. Streamlight TLR-1 Tactical Light; two 3-volt, CR123A lithium batteries; and keys for attaching to Glock-style, Picatinny, Beretta 90two, S&W 99, and S&W TSW gun rails. Light up the night with one of the finest flashlights going. Order Today!